The U.S. can encourage long-term, practical reform through the deft application of carrots and sticks. The sudden and dramatic resignation of high-profile U.S. diplomat Bill Richardson from Aung San Suu Kyi’s international advisory panel on Rakhine state is a stark reminder of the fraught circumstances surrounding the civilian government’s mismanagement of Myanmar’s Rohingya crisis. It should also serve as a clarion call for U.S. policymakers struggling to maintain leverage as the country teeters on the verge of a return to military dictatorship. In late January, Bangladesh and Myanmar announced that they would postpone a repatriation process they had agreed to in November. Bangladesh insisted that the Office of the UN High Commissioner for Refugees (UNHCR) be involved in verifying that resettlement conforms with international law and protects the rights and safety of over 600,000 displaced Rohingya. 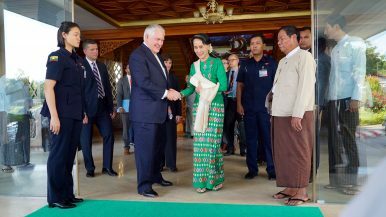 In his resignation announcement last week, Richardson, former ambassador to the United Nations and a cabinet member in the former administration of Bill Clinton, blasted “the absence of Daw Suu’s moral leadership on this critical issue.” He said he “was extremely upset at State Counselor Daw Aung San Suu Kyi’s reaction to [his] request that she address the situation of the two Reuters journalists” who have been detained for reporting on the Rakhine state massacres. The pendulum of U.S. Myanmar policy appears to have swung back to a status quo ante in which the White House lacks leverage and human rights advocates in Congress lead the charge clamoring for sanctions – only now, their erstwhile figurehead Aung San Suu Kyi is supposedly in charge of things. American policymakers urging action are loath to lose influence by using broad-based economic sanctions. There is a consensus that previous sanctions in the 1990s and 2000s did little to advance human rights in the country and in fact may have prolonged the impoverishment of ordinary Burmese, while the military and cronies continued to enrich themselves with lucrative oil and gas deals. Senate Majority Leader Mitch McConnell, who sponsored previous sanctions bills against the Myanmar junta, opposes the new resolution, which he sees as unfairly “going after” Suu Kyi. McConnell argues that she still represents “the greatest hope” for encouraging democratic reform. As the U.S. government finds itself in a familiar rut with Myanmar, it is worth reflecting on a potential middle path. Washington can endorse targeted sanctions while applying pressure on Aung San Suu Kyi’s government to implement measures to safeguard vulnerable populations in Rakhine. This will require standing up to the military and urging restraint to a vitriolic and jingoist citizen body. Suu Kyi has a great deal of moral influence, following decades of house arrest and a cult of public adoration. Therefore, her silence is especially powerful in shaping popular animosity against the Rohingya and international media and rallying support for the military. As Ben Dunant notes, Myanmar is a “society of hierarchy and deference.” People’s attitudes are shaped largely by the words and positions of authorities. Admittedly, the prospects for Suu Kyi taking such a principled stand are slim. But other thought leaders in government and civil society who hold more tolerant and progressive views are speaking out, and should continue to do so. U.S. Ambassador Scott Marciel recently told an interviewer: “You don’t build a democracy with just one person.” Preparing the groundwork for a culture of democracy is a generational process that requires ample patience and tangible support for those engaged in civic engagement. Therefore the United States must continue to empower civil society actors and political leaders from within the NLD’s ranks as well as other parties who will rise in the ranks to lead the country in years to come. There is increasing recognition among international analysts that Suu Kyi is not the darling poster child for democracy that many believed. But advocating peaceful political change in the country requires pragmatism and a willingness to consider policy alternatives. Targeted sanctions against those responsible for atrocities in Rakhine state are unavoidable and warranted. But to advance carrots, not just sticks, requires a deft hand. The United States and international proponents of Myanmar’s democratic success need to balance censure with engagement. They should also empower moderates within Myanmar who espouse tolerance for ethnic minorities and who are willing to confront the military by advancing practical solutions for political reform. Hunter Marston is a Washington, DC-based Myanmar analyst. You can follow him on Twitter @hmarston4.